In the book, Beyond the 120 Year Diet: How to double your vital years, Roy Walford, MD, proposes that longevity can be significantly increased by following a diet that is high in nutrients, but contains about a third less calories. In addition to potentially extending the human lifespan to 120 years, Walford claims that his program will also extend functional lifespan. In other words, our ability to enjoy a healthy, active and independent life will be maintained as we age. This program can also be an effective preventative approach for those with a family history of diabetes, rheumatoid arthritis, breast and prostate cancer. Walford also states that it will not only prevent but also can actually reverse coronary heart disease and high blood pressure. The main concept of Walford’s program is to consume a diet that is high enough in quality so that nutrition is not compromised. Because you will be limiting your calorie intake it is vitally important that every food you eat is very high in nutrients. It is the combination of a low daily calorie intake and a high nutrient density that is supposed to offer the greatest benefits for health and longevity. The general diet is low in fat with a moderate amount of lean proteins, low glycemic index carbohydrate, and an abundant intake of fresh fruit and vegetables. Because the diet is high in volume, fiber and nutrients, dieters should not feel hungry after meals, even though the calorie intake is reduced. The book includes twenty days of high nutrition menus that contain less than 1500 calories a day. The Beyond the 120 Year Diet suggests that dieters take up to two years to reach their ideal weight; depending on how much weight they have to lose. He stresses the importance of losing weight slowly because the longevity effects of calorie restriction do not occur when weight loss occurs too rapidly. The book also includes information about a variety of tests that you can do at home and in the doctor’s office to estimate your biological age. Walford also provides recommendations for nutritional supplements to reduce the risk of diseases commonly associated with aging. Fruit, vegetables, whole wheat bread, oatmeal, legumes, skim milk, low fat yogurt, cottage cheese, turkey, chicken, salmon, tempeh, tofu, eggs, herbs and spices, mustard, tamari, olive oil, balsamic vinegar, salsa, dark chocolate, red wine. Although exercise cannot extend the maximum lifespan it can reduce your risk of developing certain conditions such as cancer and heart disease that can impair quality of life. A combination of aerobics, strength training and flexibility exercises are recommended in Beyond the 120 Year Diet. Excessive exercise should be avoided because it increases the production of free radicals, which may accelerate the aging process. 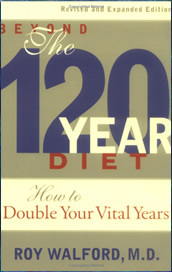 Beyond the 120 Year Diet: How to double your vital years retails at $16.95. May enhance longevity and reduce the risk of developing chronic illness. Can reverse coronary heart disease and high blood pressure. Will almost certainly result in weight loss. Possible to eat out so long as weekly calorie intake is monitored. Requires counting calories and measuring portion sizes. Many dieters experience hunger on a reduced calorie diet, especially when fiber intake is inadequate. Some readers may find the information in this book too technical. Careful guidelines must be followed to make this program suitable as a lifestyle approach to eating. Beyond the 120 Year Diet will appeal to readers who wish to understand the scientific basis for calorie restriction as well as the dietary causes of the diseases of aging. However, dieters should be aware that calorie restriction must be done properly in order to be safe, so it is essential to follow Dr. Walford’s instructions and to consult with a physician to monitor your progress while following this plan. Walford, R. L. (2000). Beyond the 120-year diet: How to double your vital years. New York: Four Walls Eight Windows.